Reindeer names – oh my goodness…. …. 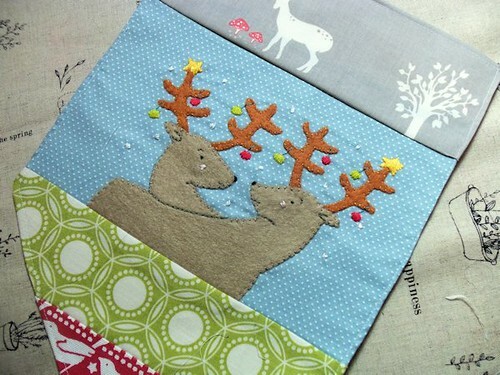 I am so enjoying reading all your wonderful suggestions for my little Christmas fabric reindeer pattern’s name. I laughed until I (nearly) cried over “No Idea!” (assuming he was named before his eyes were added – groan), was very attracted to the idea of “Bertie Bustle”, loved the suggestions incorporating “Buttons” and all the other amazingly creative ideas too. Thank you so much to everyone who has left a comment. Then when I reached the end I realised I had forgotten to say that the draw would close on Friday night, so if you’re reading this and haven’t entered yet – there’s still time to do so. I’ve nearly completed all the applique and am just assembling the flags using the stitch’n’flip technique. I’ll be listing the SewFlapdoodle Christmas Garland pattern at the weekend, and will also be sending a free Christmassy SewFlapdoodle design to all my newsletter readers and e-zine subscribers. I only assembled two flags this morning though – I was rudely interrupted by an extremely impatient dog (sure you can guess his name!) who was very anxious to head to the beach. So, before he could swish his tail and send all my fabric flying to the floor in a confused mess, I packed him into the car and we set off for Blackpool Sands. We haven’t been there since last March as dogs are banned from this beach in the summer months. But in the winter it’s a great place to take your canine companion – especially as the Venus Beach Cafe remains open all year long. 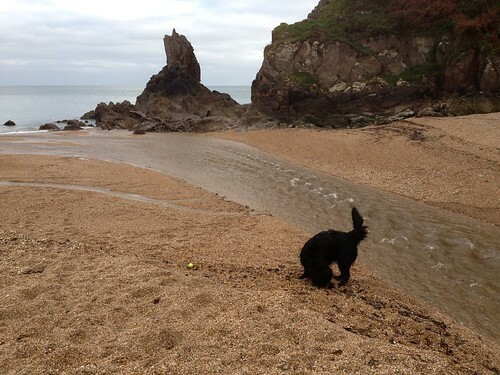 It was a bit grey and chilly, but Ben had great fun re-acquainting himself with one of his favourite places to swim – a lovely stream that runs through the shingle down to the sea. Luckily there wasn’t any smelly seaweed on this beach for him to roll in – I don’t know if I mentioned – but after his bad behaviour in rolling at Lannacombe, Donna (his grooming lady) shampooed him twice – firstly in Apple and Avocado, and then in Rosemary and Mint, after which she rubbed him all over with Lavender fur-shine. And it’s hard to believe I know, but even after all that we could still detect a whiff of seaweed in his fur. Bad dog! Oh Helen the garland is just sew sweet, love it!! Glad Ben had a very nice and unsmelly trip to the beach with you! Oh Ben the mixture of Avocado, Apple, Rosemary, Mint and Lavender sounds wonderful, does your grooming lady have any to spare to wash my hair in. Next time you go to Blackpool Sands may come? I spent many a happy childhood playing on those sands on my annual holidays, I even took my boys when they were younger too. Love the banners…very, very cute! I hope Ben had a wonderful time at the beach! Lovely new banner! … Very cute and festive!! It was very nice to see Ben playing at Blackpool Sands once again. It seems to be such a beautiful beach, and I’m glad there were no further seaweed incidents! 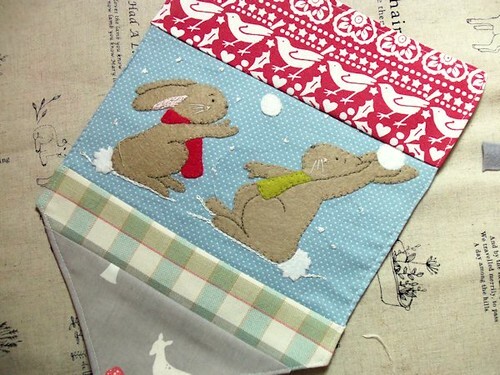 I just love the flag patterns, especially the bunnies!